Brad Mills joins Chris Constantino at the 2016 annual convention of FRIENDS: The National Association of Young People Who Stutter. Mr. Mills shares that he is attending the 2016 FRIENDS Convention for his daughter who stutters and ended up finding support for his own stuttering as well. Other topics include watching children have fun while learning to accept stuttering and observing attendees embracing their stuttering at FRIENDS. 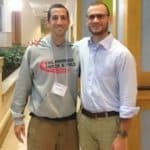 Mr. Mills discusses going back to school to become a teacher despite his stuttering and shares with Chris that this StutterTalk interview is the most he has ever spoken openly about stuttering. Brad shares, “When you’ve been closed for 39 years it is hard to just open up” and goes on to discuss the relief of acknowledging your stutter for the first time. Brad Mills is a high school science teacher from Somerville, Ohio attending FRIENDS for the first time with his family because his daughter is stuttering. Brad also stutters.